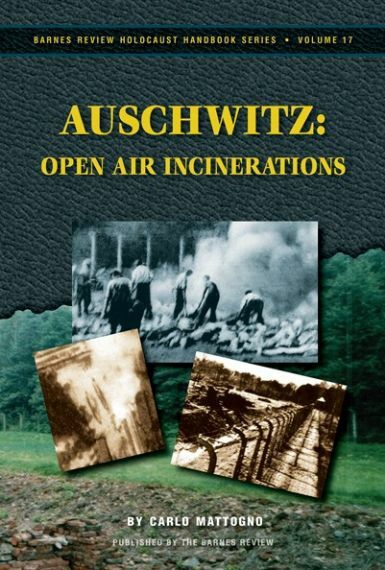 Mattogno Carlo Auschwitz Open Air Incinerations. In spring and summer of 1944, 400,000 Hungarian Jews were deported to Auschwitz and allegedly murdered there in gas chambers. The Auschwitz crematoria are said to have been unable to cope with so many corpses. Therefore, every single day thousands of corpses are claimed to have been incinerated on huge pyres lit in deep trenches. The sky over Auschwitz was covered in thick smoke. This is what some witnesses want us to believe. This study investigates all available documentary, physical, and anecdotal evidence. Carlo Mattogno shows that the witness statements contradict each other in every regard. They also contradict what would have been physically possible. The fact that there is no documentary or forensic evidence supporting the claims is finally explained by air photos taken by German and Allied air planes in 1944. They prove that the witnesses were wrong: No traces of huge pyres or massive smoke covering the camp can be seen.